Dean John Rosenberg and other convocation speakers urged graduates to recognize the help of others and to seek out ways to return their service. 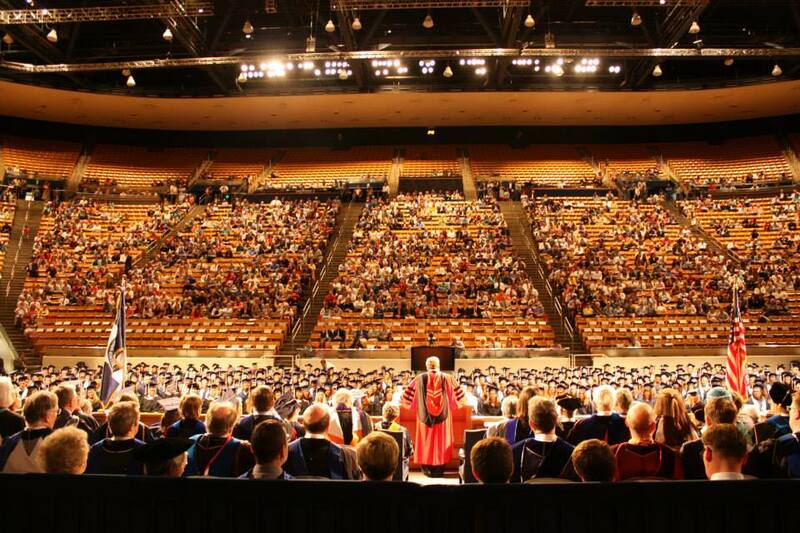 PROVO, Utah (April 24, 2015)—An excited crowd gathered in the Marriot Center for what would be the last meeting many of them would ever have on campus. But though their years of study come to an end, these graduates leave equipped to make an impact on the world for the better. In this year’s convocation, the College of Humanities said goodbye to another generation of students, with 465 bachelor degrees and 51 graduate degrees awarded to its graduates. Dean John Rosenberg opened the convocation, simultaneously sending off the graduates and closing a decade of service as the college’s dean. In his remarks, Rosenberg compared the graduates to the pilgrim of Dante’s Inferno who “did at length come up to the point where the last stone breaks off and the breath was so spent from [his] lungs when [he] was up that [he] he could go no farther, but sat down as soon as [he] got there.” Upon resting, the pilgrim was moved to action by his guide, the poet Virgil, who urged him to rise and push forward. Graduates can sympathize with the pilgrim, having now passed through fatigue and oftentimes overwhelming trial in order to reach their goals. Just like the pilgrim, they have been able to push forward, receiving strength from others. More often than not, that company goes unnoticed, and we are unaware of the work others do on our behalf. At Brigham Young University, students benefit from a relatively low tuition rate, made possible by the tithes of members of The Church of Jesus Christ of Latter-day Saints from around the world. Andrew Kelly Nelson, who graduated with a B.A. in Portuguese and Latin American studies, spoke of the great blessing that it is being a student at Brigham Young University. Leslee Thorne-Murphy, associate professor of English and graduation speaker, echoed this sentiment as she urged the graduates to make the most of their educations and improve not only their own lives but those of everyone around them. Having been trained in the humanities, these graduates are especially well equipped to do so. By studying literature, languages, philosophies, rhetoric and cultures, humanities graduates are the most capable of establishing bonds with those most unlike themselves. Thorne-Murphy told the graduates, “Of any group here in the university, you are prepared to see through the eyes of a different culture, a different time period, a different person’s or people’s perspective.” And this is a skill desperately sought after in a world in need of peacemakers.